Read the quotes about friendships then discuss the following questions. Interesting and inspiring quotes. I hope you will find them useful. The students need to give their opinion. Have fun! This downloadable handout is intended for high school students and adults at Pre-intermediate (A2), Intermediate (B1), Upper-intermediate (B2), Advanced (C1) and Proficient (C2) level. It can be used for improving your learners' Speaking and Reading skills. 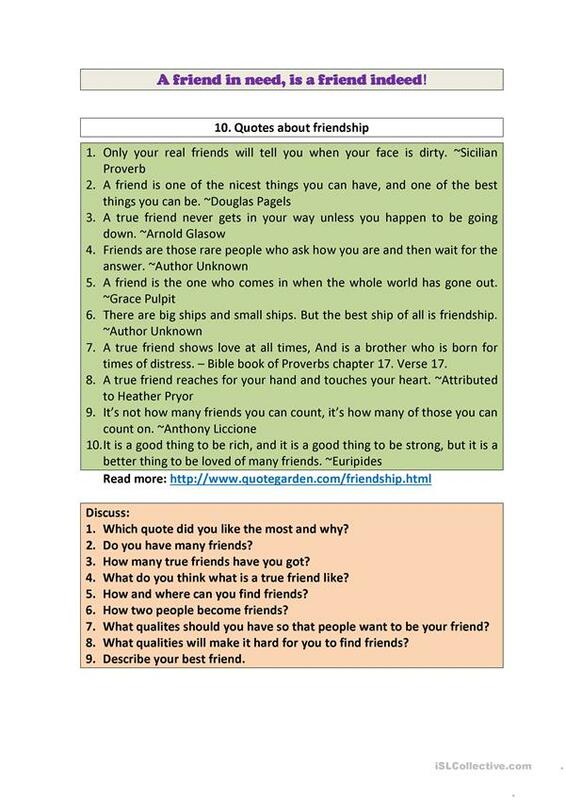 It focuses on the vocabulary topic of Friends. I lived in the U.K. for 3 years. At the moment I am living in Malta where English is an official language. I am married to a British man so we communicate in English as he doesn't speak any Hungarian. I teach English mainly for Hungarians.